Howdy, everyone and welcome back! I apologize for skipping a Wednesday post this week, as this final days in school have kept me on my toes. That combined with the funk of a shorter work week, left me a bit unprepared, so I’m sorry. Anyhow, how did you guys like The Basics Series that wrapped last week? Did you find it helpful? Leave me a comment below with your feedback! Now that is the end of the month along with the spring season, I find it an appropriate time to do another empties post. 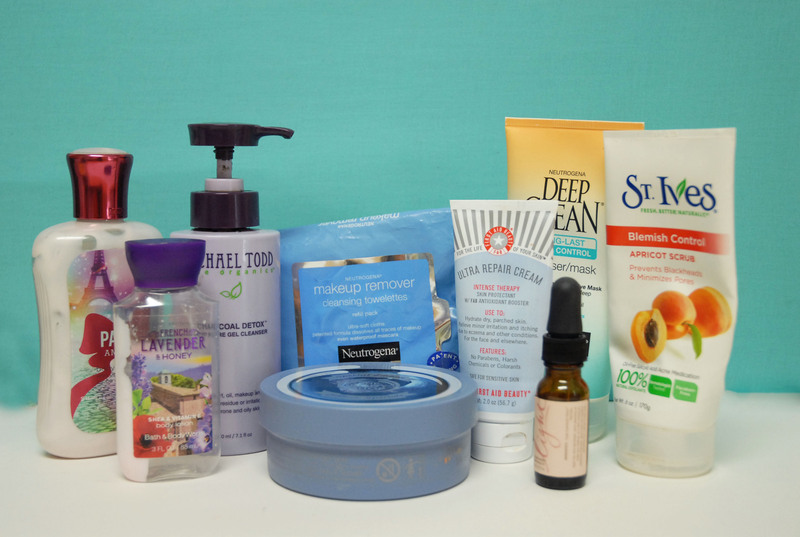 Just a quick recap, an empties post is a review on products that have been used up. This type of post allows for a product’s lifetime to be examined and evaluated. For further explanation, see my last empties post. Since I am moving out soon this is the perfect time to get rid of some of my clutter. I haven’t done one of these since January and have built up quite the collection this time around, so without further ado, let’s get started! 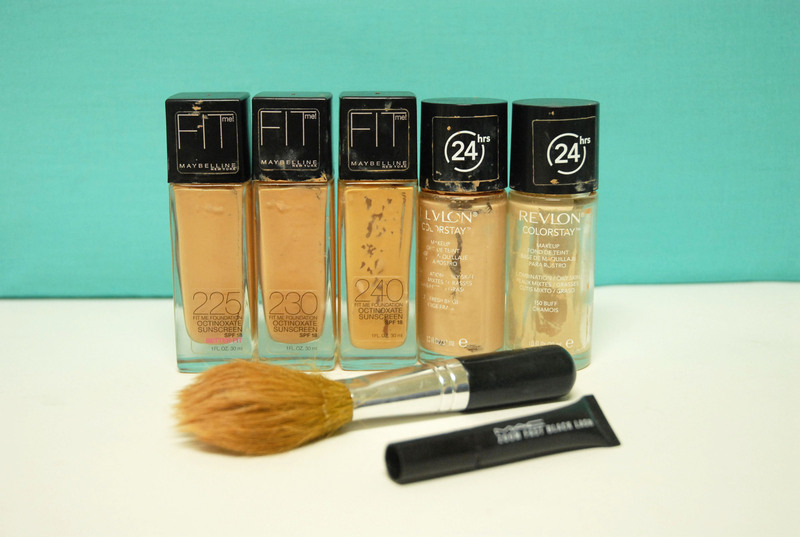 Maybelline Fit Me Foundation– Yes, you are looking at 5 bottles of foundation, three of which are this Fit Me dewy formula. I mix these and the Revlon Colorstay to create the perfect medium-full, not too matte or dewy, foundation for me, personally. I know it seems quite excessive, but keep in mind, this is my usage over about five months. All of these bottles were used before the matte formula came out, and they are all different colors (haha). I am never consistently the same shade and gradually get tanner as the warm months approach. I used up shades 225, 230, and 240. The 225 was my winter shade, 230 is my transition spring to summer shade, and 240 is a bit too dark for me right now but is a good color for me in the summer, but I bought it to mix with my super light Revlon Colorstay so that I could use that up. Likes- The light texture leaves the skin feeling not weighed down by a heavy feeling. It provides a nice light-medium coverage, but still leaves a more natural look. 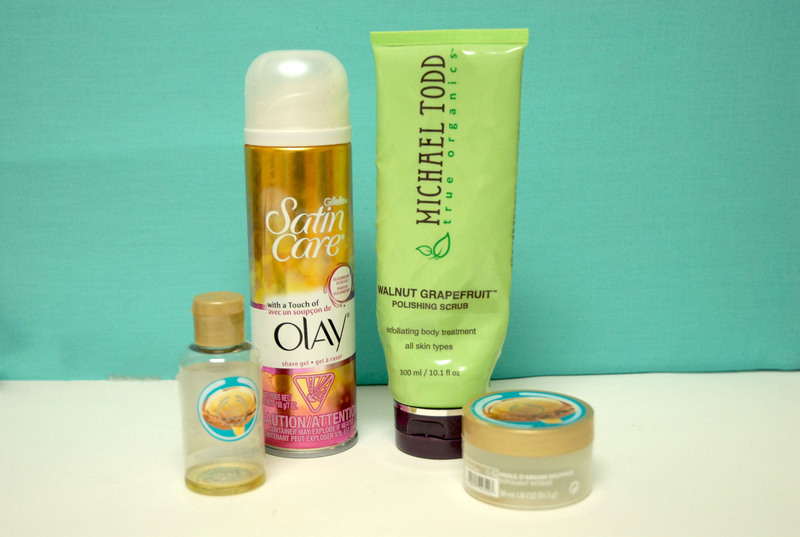 Dislikes- These are all the dewy formula, which doesn’t suit my oily skin type the best. On it’s own, it evened out my skintone but did not provide me with the fuller coverage I prefer, which is why I mix it with the Revlon. Also, this contains SPF 15 which is nice for everyday purposes, but definitely has flashback when photographed. Revlon Colorstay Foundation– I have used up two bottles of this foundation in the Oily skin formula. This is my preferred foundation for any long day or event where I know I will be taking pictures. Likes- I like the full coverage and longwear ability this foundation has. It definitely doesn’t last the 24 hours that it claims, but I’ve worn this for at least 16 hours before (with a primer) and only had minimal fading throughout the day. Dislikes- This is way too heavy for everyday use and is a tad on the expensive side for drugstore ($10-$12). Bareminerals Flawless Application Brush– This was a hand-me-down and one of my first face brushes. I’ve had it for about 4 years. It’s not really an empty product, but I am throwing it out because all of the bristles are actually detached from the handle and it is beyond repair. I know it looks fine it the picture, but it’s actually an illusion and I just placed the pieces super close together. Likes- When I didn’t have many brushes, I liked this for blending out foundation and other face products. Dislikes- It did not take to vigorous washing very well and began to shed very easily towards the end of it’s life. Now that I have other brushes and the Beauty Blender, I don’t find that this brush is very useful in my collection anymore. MAC Zoom Black Lash Mascara sample– There is a sample section of this post, but I decided to insert this product here since I didn’t have very many makeup empties and this is a deluxe size version rather than a small packet, if that makes sense. I got this a year or two ago and had it in an old purse and forgot about it, so it unfortunately dried out before I used it all. Likes- This has a nice wand for being a sample and the formula was nice for lengthening. It was super black from what I can remember and was the perfect handbag size. Dislikes- I didn’t really dislike anything about this except for that it dried pretty quickly, but I think that was only because of the size. Not Your Mother’s Clean Freak Dry Shampoo– This was my go to dry shampoo since I started using the stuff because it was one of the first drugstore options available. Likes- When I started using dry shampoo, this was one of the more affordable options. I also really like this brand in general. They have a good sea salt spray and their smoothing serum is nice. Dislikes- Towards the end, it can get concentrated with the powdery stuff at the bottom and leaves white spots if you’re not careful. Wen Winter Cranberry Cleansing Conditioner– I’m fortunate enough to have a generous aunt who gifts Wen products to me. They are basically an effective 2-in-1 shampoo conditioner concoction. Likes- I like this particular scent out of most of the ones I have tried, however it was sadly limited edition. This product is nice for removing weekly product buildup after shampooing when it is not enough, but too much to do a second shampoo. it also lasts a super long time. Dislikes- The packaging is rather difficult and the pump isn’t always easy to use. Likes- I love this stuff and it is my absolute favorite drugstore conditioner. 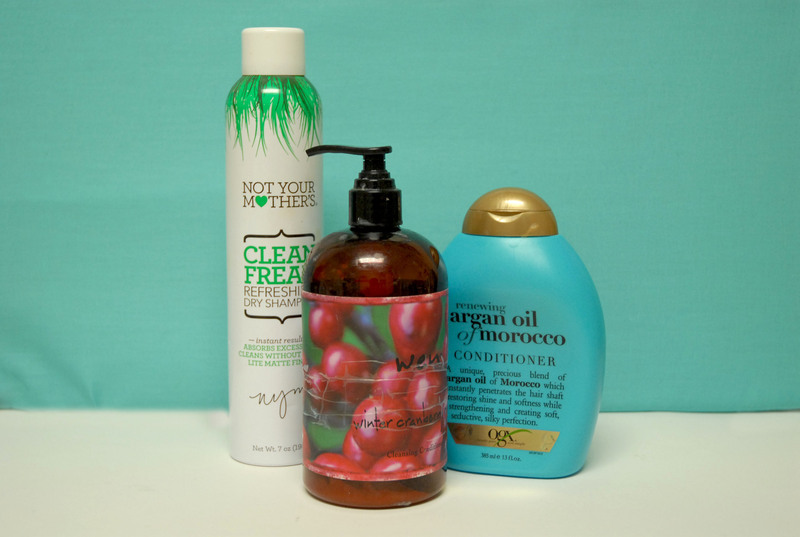 I like quite heavy and nourishing conditioners since I have quite thick hair myself. This stuff helps keep my hair silky and smooth. Dislikes- This is a small bottle and I went through it pretty fast. I usually like to buy a bigger bottle, but unfortunately it wasn’t an available size at Target when I went. The Body Shop Argan Oil Shower Gel mini– I also featured this product in my Argan Oil products post, in case it looks familiar. It is just a travel size shower gel from a holiday set. Likes- This product was super simple and self explanatory. There is no fuss or muss with it, it smells of pure argan oil and has no fillers or crazy scent combinations. Dislikes- I have no complaints about this. My only gripe is that it didn’t last long, but that’s a given with it’s size. A little does go a long way with this product, though. Likes- This is actually one of my favorite shaving gels. I know that it’s an odd thing to have a preference for, but that’s just me. As far as texture goes, most shave creams are the same, and I can usually get along fine with anything else. The scent is what really sells me on this because I find that with women’s shaving creams, for whatever reason, always smell super strongly. This one, however, does not. It has a definite scent but it is not overwhelming or overbearing like the last shaving cream I used up in my last empties post. It also usually tends to be on sale or discounted at Target consistently. Dislikes- I don’t dislike this product at all. I truly stand by it. Michael Todd Walnut & Grapefruit Body Scrub– I received this product as a freebie add on when I purchased my Charcoal Cleanser two summers ago. It’s a natural physical exfoliant, free of microbeads. Likes- I like that this is a good sized product and contains a lot within the packaging. I also appreciate that this is free of microbeads. It gets the job done. Dislikes- Don’t get me wrong, I love Michael Todd and the actual product is good, however, this packaging is what ruined this for me. The squeeze tube was inefficient and got backed up easily since this is quite a chunky product. Due to this, I couldn’t get out a bunch at a time and even got to a point where I couldn’t squeeze anything out, even after removing the cap, despite the product being at least 2/3 full. I loved this stuff but I couldn’t even use it and it ended up drying out so I have to toss it. The Body Shop Argan Oil Body Scrub mini– This also came in the holiday set with the shower gel and was featured in my Argan Oil post as well. Likes- This is a gentle scrub and is a nice jelly consistency. Dislikes- I’m not quite sure, but it felt like this product contained microbeads, an ingredient which I am trying to avoid using. Nonetheless, whatever the exfoliant was made of, I found it to be too round and it would slide off the skin too easily, and not quite exfoliating very deeply. Bath and Body Works Paris Amour Body Lotion– I featured a different scent of this same product in my last empties post, and my opinions are pretty much the same. I haven’t quite used all of this product up, but I am currently trying to clean out and finish up as many products in my collection as possible, so that I can throw them out before moving out and won’t have to transport them back home with me for the summer. Likes- This a delightful and luxurious scent that has pretty floral and musky with warm notes, perfect for the cooler months. It is one of their more sophisticated scents, which I appreciate. However, once again, the quality of the scent exceeds the quality of the actual moisturizer itself. Dislikes- It isn’t as nourishing as I would like my body lotion to be, but it can get the job done. In fact, I usually add a few drops of pure argan oil when working this product into my skin to supplement that. The product also contains alcohol as a fragrance preservative, which some people can find drying on their skin. Bath and Body Works French Lavender and Honey Body Lotion mini– I mainly use this for travel, and it has lasted me about a year. However, I really only use it when I am traveling, which isn’t too frequently. Likes- Once again, this scent is phenomenal and is probably one of my favorite B&BW scents. It is a beautiful light floral with a hint of warmth and vanilla undertones, perfect for spring and summer! However, just like before the fragrance exceeds the quality of the lotion. I can get along with it, especially since it’s usually just a few days because I use this for travel. Dislikes- Same as before, it’s just not quite there. This product will add moisture in the moment, but will not continue to keep the skin moisturized throughout the day or work at softening the skin. Michael Todd Charcoal Detox Cleanser– I did an in depth review of this product already, comparing it to the Biore charcoal cleanser, which you can view here. Likes- I adore this product. It lasts so, so long! According to Instagram, I’ve had this for 90 weeks- that’s almost two years! It’s super effective, has an amazing scent, the pump packaging holds up, and I cannot get enough of this stuff. It’s the best daily cleanser I’ve tried thus far. Neutrogena Makeup Remover Wipes– I featured this in my Basics Skincare post this month, so if you would like to learn more about skincare take a look here. Likes- These are my favorite makeup wipes. They really remove the most makeup out of all the ones that I have tried and even get most of the tough stuff like waterproof mascara. I buy them in bulk at Costco and they don’t dry out easily. I go through about a pack a month. Dislikes- Not so much of a dislike, but a given, these wipes really only remove about 80-90% of your makeup. Additional cleansing will always be needed to remove remaining makeup and clean the skin. Also, these aren’t a super eco-friendly option, but I haven’t found a good alternative to this yet. The Body Shop Blueberry Body Butter– This scent is supposed to be limited edition, however you might still be able to get it on the website. Likes- Unlike the B&BW lotions, these are so much richer and provide intense moisture. They really sink into the skin and keep skin soft for days. I have come to love this formula and prefer it to anything else. All of The Body Shop scents are simple, and non irritating. The fragrance is always one note and is much more natural than the heavily perfumed Bath and Body products. Dislikes- The price of these is a bit absurd, at $21 for about 7 oz of product, so I only really buy when it is on sale. First Aid Beauty Ultra Repair Cream mini– I featured this product in my Winter Favorites post at the beginning of the year, so if you would like to know some more of my thoughts, click here. Likes- I have super dry hands so I like having something extremely rich and creamy to apply to them. This does the trick and is free of fragrance, parabens, harsh chemicals, and colors. Dislikes- Although it has no added fragrance, it has a subtle yogurt-y scent from the natural ingredients which isn’t my favorite. Neutrogena Deep Clean Cleanser and Five Minute Mask– I use this product in the shower and don’t really use it to cleanse my face everyday. Likes- This is the perfect five minute mask! It is a nice quick treatment in the shower that I can throw on while my conditioner is sitting in my hair and gets rid of any oiliness I have. I also checked on beatthemcrobead.org, and this is one of the few Neutrogena products that is free of microbeads. Dislikes- It has a slight medicinal scent, which I didn’t enjoy at first, but got used to. Likes- This is one of the few physical exfoliants that does not contain microbeads. I do not like microbeads because they’re harmful to the environment, too round to do any actual exfoliating since they roll right off the skin, and they can actually break blood vessels and capillaries because when they do make contact with the skin, they press into the skin. This has a good grit though and sits on the skin nicely. I use this both on my face and body since I struggle with little acne bumps on my shoulders and ingrown hairs in my armpits (gross, I know). The salicylic acid helps with the bumps by drying out the pus (ew!) and smoothing down the skin to prevent other bumps. I like this better for body, though because I’m trying to use physical exfoliants as little as possible on my face and am beginning to make a transition towards acid exfoliants, per Caroline Hirons’ recommendations. Dislikes- This lasts for-freaking-ever. It’s mostly a good thing, but it takes me a while to get through and I feel it can start to go bad. 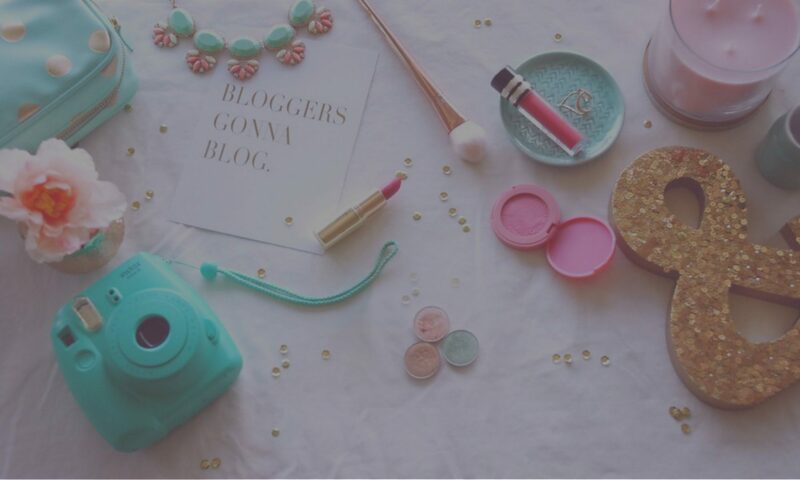 Josie Maran Argan Oil Light mini– This was also a feature in my Argan Oil post. Likes- I like that is formula is light and absorbs quickly into the skin and doesn’t leave behind a residue, while still being nourishing. It works well as a facial moisturizer. Dislikes- This is so expensive! This tiny little vial is only half an ounce and it costs $16!!! Likes- These do the job and really brighten up the teeth. They produce a nice smile but will not completely whiten in one sitting. The fit of these is really secure and stays nicely. Dislikes- Also quite expensive, there are only 8 full treatments in this box which normally costs about $25 but I got this in a double pack on sale for around $35. They are more for touch ups rather than an initial whitening. I also notice that my teeth do tend to be sensitive for up to a day after use. Also, I do not feel like 1 hour is an “express” time. Normally, I use the generic Walmart brand gel moldable trays and the wait time is only around 30 min. Likes- This is a nice light and fresh scent and it eliminates BO easily. I appreciate the clear gel formula since it doesn’t leave any white marks under your arms. Dislikes- This does contain aluminium, which I have become more wary of recently. I really only use this now if I know I will be out for a while and try to use it as little as possible. Unfortunately, I bought this in bulk so I am trying to finish it up before I try any alternatives. Also, if you get it on your clothes it can dry with a white tint, so be careful. 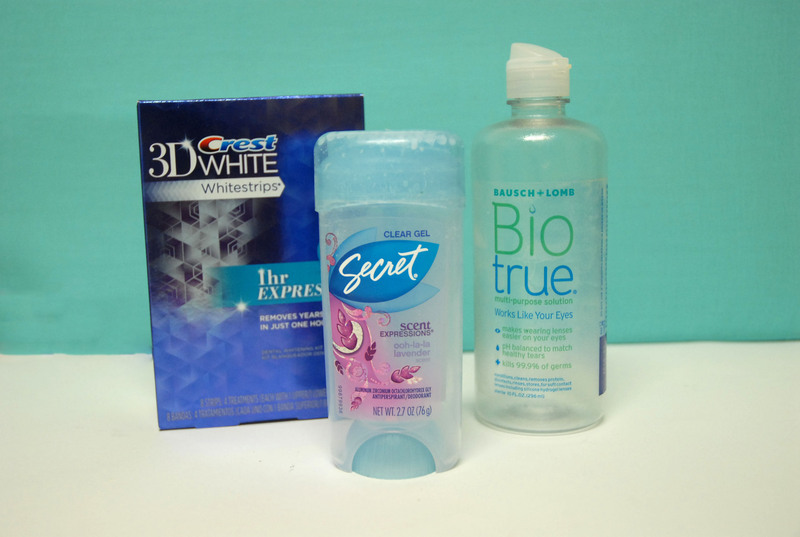 Biotrue Contact Solution– I featured this in my last Empties post, but I wanted to include it again for timeline purposes. I usually use about one of these every 2-3 months. If you would like to read about my likes and dislikes, refer to that last Empties post. Likes- I take these primarily for helping with my skin, but I have noticed a difference in my hair growth as well. They taste nice and are quite soft. I don’t take them every night, so this supply lasts me about 4-5 months. Dislikes- I don’t have much to complain about but I do think this large bottle is excessive packaging. Likes- This is a great base coat for smoothing nails before applying nail polish and neutralizing the nail bed color. There is a slight scent which helps distract from the nail polish smell but does not completely mask it. Dislikes- I took this in my checked luggage last summer on a plane flight and when I got my bag back, security had undone the top and not screwed it on all the way so half had spilled out *le sigh*. I feel like this product would have lasted me for so much longer if I hadn’t lost half of it. But towards the last third, it was almost completely dried up and stringy and applied patchy. Likes- I like that these are a gummy formula and make it easy to take daily vitamins (even if I don’t everyday haha). Dislikes- These tended to stick together and create large clumps so I did find myself having to reach into the bottle and pull these apart, which isn’t super sanitary. Likes- I like that this stuff is easy and affordable and does the job. it also doesn’t leave the nails dry, which I really appreciate. 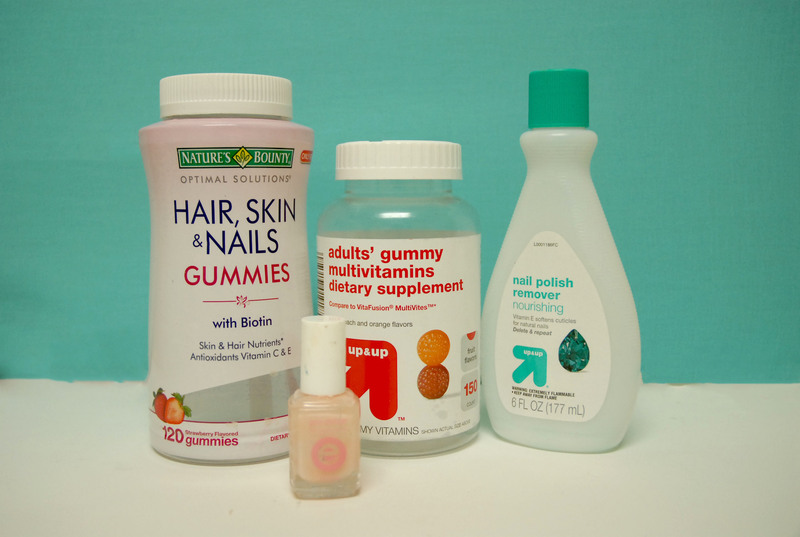 Dislikes- This does not easily remove glitter polishes or very heavy gel formulas. I do use a gel alternative top coat and find that this does easily remove that though. Likes- This was a beautiful champagne, cool toned shimmery base color. I first used this back in February when I flew out to Salt Lake City for a long weekend and could only bring a limited amount of liquids and creams because I didn’t check a bag and only had a carry on. It is a good size and I got at least 10 uses out of it because a little goes a long way. This is a nice base for putting under just a simple shimmery lid color, and enhances a nice champagne color nicely. Dislikes- This will not be suitable if you are trying to go for a matte look. Likes- This is extremely gentle and is pretty creamy, giving the skin some slight moisture. It lathers nicely and I got about 2-3 uses out of this. Dislikes- This had an odd scent, similar to the Repair Cream mentioned previously, but much stronger and with an undertone of glue. It isn’t a power cleanser and really is more suitable for those with sensitive skin who need minimal daily cleansing and who do not wear heavy makeup, unlike me. Conclusion- I don’t personally think I would buy a full size of this for me, but I would recommend for anyone with sensitive skin. This range just isn’t suited for my face, and I much prefer their red clay line for my oily skin. I am glad that I did have the opportunity to try this out though, however. Likes- This is such a wonderful product! This tiny little vial has given me at least 4 uses and I have about 1 left. The scent is a wonderful citrus and I really like how a tiny amount is super effective. Honestly, the tiniest dime sized amount removes a full on face. I’ve tried the MAC Cleanse Off Oil before, and I feel like you need about twice as much product of that compared to this. This also leaves the lashes super hydrated and soft as well! Dislikes- I don’t dislike anything!! Likes- I used this foundation sample on that same trip where I had limited liquid space. This is a nice medium to light coverage and it sits smoothly on the skin, with quite a natural satin finish. Dislikes- This is almost like an inbetween of the Maybelline Fit Me dey and matte, which isn’t as much coverage as I would prefer for me, personally. Also, it wasn’t super long wearing and really only lasted a few hours. Likes- This is a nice gel cleanser that foams nicely and leaves the skin clean. It is super gentle and non-irritating. I got about 4 uses of this, so a little goes a long way. Dislikes- This has a very strong cucumber scent which I don’t particularly enjoy. This is a nice formula, but it is a bit too gentle for me and doesn’t remove all of the excess makeup I would like it to. Likes- This is a silicone primer and very comparable to the popular Smashbox Photofinish primer. It leaves the skin super smooth, even smoother than the Smashbox, I would claim. A little goes a long way with this product as well, as I got about 5 uses out of this. Dislikes- This does not have great oil control but it is great for photography. I would layer this over a mattifying primer or use this only for taking photos. Alrighty, I know that this was a long one, so if you are still with me, much thanks! I hope you enjoyed this post and going through my trash with me. What products have you used up lately? Leave me a comment below! Holy cow! 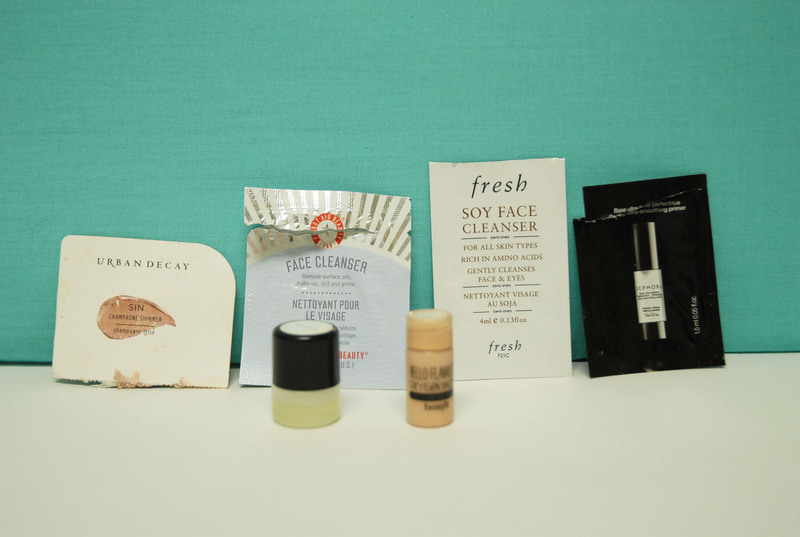 What a great empties post! There is so many!!! Empty posts are my favorites. I love the revlon color stay foundation, it’s my go to when I wear foundation. My favorite drugstore dry shampoo is doves, if you wanna give that a try. It smells fantastic!!! My favorite high end one is by bumble and bumble and it is a powder vs a spray. I love it! Thanks so much! I always love your comments so thanks for leaving them 🙂 I’ve heard good things about the Dove dry shampoo so I will try that soon. Thanks for your recommendations!